When you do online gaming or are simply using an online program do you keep getting kicked out of the game or experience lag? If you do, then you need to make a port forward for that game or application. Your Huawei Tattoo HG630 router has a firewall that helps protect your home network from unwanted Internet threats. The firewall does this by blocking all incoming and outgoing connections that are not recognized. Your game or program ports are being blocked. This process of opening ports is called a port forward. 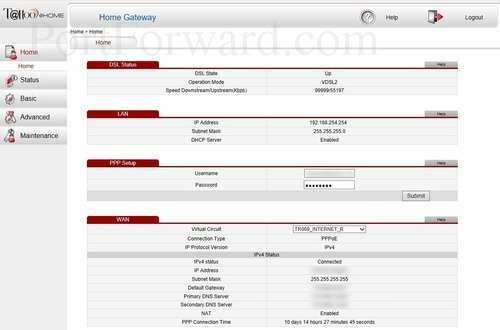 How to create a static IP address for the exact device you are forwarding these ports to. 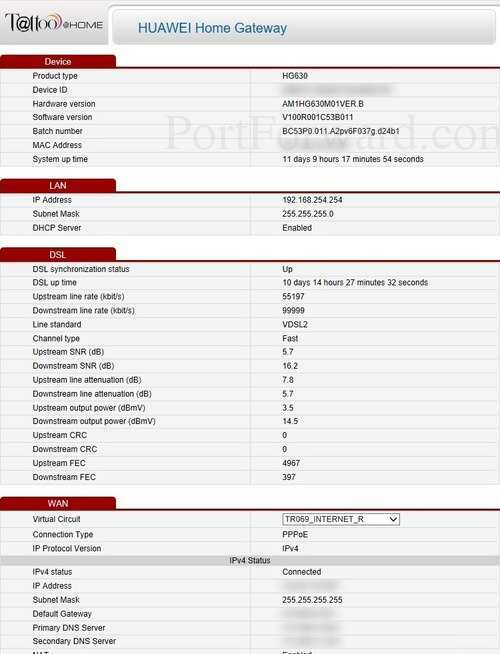 How to login to the Huawei Tattoo HG630 router. In this step, we show you how to login to the Huawei Tattoo HG630 router. Did you know your router uses a web interface program to manage it's settings. This means you need to login to the management pages using a web browser. It should not matter what browser you decide to use. I recommend picking the one you are the most comfortable using. The common web browsers are Chrome, Firefox, and Internet Explorer. In the image above the address bar has 192.168.254.254 in it. All you need to do is type the router's IP address into the address bar. Sometimes a router manufacturer will call the router's IP address the router's default gateway or the router's GUI address. If you have changed the router's IP address in the past and don't remember what you changed it to, check out this page titled How To Find Your Router's IP Address. Once you have found the login page, you need to enter the username and password for this Huawei Tattoo HG630 router. Once you have entered the username and password for the router, press the Login button to access the rest of the Huawei Tattoo HG630 router. One troubleshooting option is to try other Huawei passwords. If you have a different firmware version you could easily have a different username and/or password as well. Here is our list of Default Huawei Router Passwords. Another option is to try and guess what you changed it to. If the above option did not work, it is because you changed the username and/or password in the past and don't remember. If you need help with this step, check out our Find Password App. It will automate the process of guessing thousands of different combinations. If you are interested in this you can learn more on this Router Password Cracker page. Finally, if you have tried everything else and are still stuck, it might be time to consider a factory reset. A reset like this one is a big step and should not be taken lightly. We strongly recommend exhausting your other troubleshooting options before you decide to reset the Huawei Tattoo HG630 router. Learn more about this on this page titled How to Reset a Router. On this Home page, look in the left sidebar and click the option of Advanced. Then choose the sub link of NAT. You should now be on the page you see above. At this point click the tab at the top of the page labeled Port Mapping. This port mapping page is the correct one to be on in order to create a port forward. Enable the Customization radio button. Choose an available connection from the Interface dropdown box. You can leave the Remote Host box blank. If you are just forwarding a single port number then you can simply enter that same number into both the External Start Port and the External End Port boxes. If you are forwarding a range of ports, usually separated by a hyphen, then you need to enter the lowest number of that range into the External Start Port box and then enter highest number into the External End Port box. 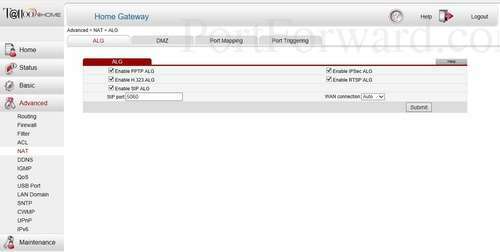 Enter the IP address of the device that you want to forward ports to into the Internal Host box. This can be either the IP address of your computer or the IP address of another device on your network. In the Internal Port box enter the port to forward. Put a name for this forward in the Mapping Name box so that you can remember why you set this forward up. The name does not matter so pick something that has meaning to you. When you are all done click the Submit button. After each port forward, make sure to click the Submit button at the bottom to save that entry. Congratulations. Your ports should be forwarded now. When you are done, it is always a good idea to check and see if the ports forwarded correctly. To test if your ports are open or not, we recommend using our Open Port Checker. It is free as long as you download our trial version of the Network Utilities. Our Open Port Checker is better than others out there because we use a local application to see if the server is listening on those ports. Our Port Checker GUARANTEES a true result. If you are still having trouble getting your ports forwarded, then you could always use our Network Utilities Bundle. It takes all the guessing out of it, we WILL get your ports forwarded for you. If you have a question, check out our forum, there is a lot of good information in there. Don't forget to check out the other guides we have here at portforward.comEverything from gaming to networking and software guides. We are your computer information source. Are you looking for guides written specifically to help you setup a router. Do you need a guide to help setup your wireless network? How about setting up the DNS or changing the radio channel? We have these and more on setuprouter.com.